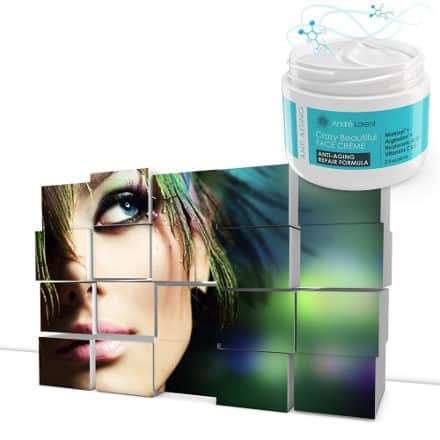 Reviews about Andre Lorent Crazy Beautiful Anti Aging Face Cream are extremely positive and people seem to love and agree on a number of benefits and features this cream has. 5 anti-aging ingredients including Matrixyl, Argireline, Hyaluronic acid and vitamins C and E.
Free of parabens, sodium lauryl sulfates, petrochemicals, derivatives, additives and fragrances. 100% free of risk money back guarantee. – The fact that this cream contains some of the most powerful anti aging ingredients on top of its list means that the amount of them in the cream should not be underestimated. – It is free of parabens and other harmful skin care ingredients. – Called “The Fountain Of Youth” by distinguished Broadway Star. – Positive results in some cases even in a matter of few minutes. – Handmade in a GMP certified and FDA registered lab. – Suitable for all types of skin. – Good for both Day and Night Use. – Small charity donation with each sell. – Some people think it is unscented or neutral and some others who are even allergic to scents think that it has a fresh clean scent which is no way unpleasant or disturbing to them. Still, I am putting the “scent” issue on the negatives list because the company says that it has no scent whereas a few people sense a scent into it that as I said is of no problem to them. – Although Andre Lorent Face Cream is free of lots of harmful ingredients, there is one ingredient Phenoxyethanol, a chemical preservative, which from what I have read, it is debatable as to how safe or harmful it can be. Argireline, Matrixyl, Hyaluronic Acid, Vitamin C, Vitamin E, Aqua, Organic Green Tea Extract, Sunflower Seed Oil, Glyceryl Stearate, Cetearyl Glucoside, Shea Butter, Cetearyl Alcohol, Glycerin, Jojoba Seed Oil, Citric Acid, Acetyl Hexapeptide-3, Hydroxypropyl Cyclodextrin (and) Palmitoyl Tripeptide-38, Hyaluronic Acid, Ascorbic Acid, Tocopherol, Xanthan Gum, Caprylic Acid, Phenoxyethanol, Potassium Sorbate. This Anti-aging cream has a number of potent ingredients that act to help prevent and fight signs of aging. Matrixyl is known for its ability to stimulate your skin’s own natural collagen production resulting in firmer and fully looking skin. Hyaluronic Acid which helps the skin stay hydrated. Vitamin C is known to boost collagen and help reduce wrinkles and fine lines. Vitamin E is also a powerful antioxidant which fights signs of aging and promotes a healthier looking skin. Using this anti aging facial product is simple. You just apply on your face, neck and decollete softy rubbing the cream on your skin till it fully absorbs. Also, keep in mind that it is suitable for day and night use. Deals with Fine Lines and Wrinkles– A majority of users reported seeing positive results with fine lines and wrinkles particularly on their forehead and around their eyes. Some of them exemplify that their fine lines have disappeared and their wrinkles look more softened and filled. While a few of them have experienced softening of fine lines and wrinkles even after a few minutes, others needed some days to see results. Hydrated complexion with no greasiness- The complexion feels more hydrated with no signs of greasiness or shine. Light and silky product texture- People like its light silky texture and think that the cream absorbs nicely. Tightens the Skin– Several users found that using this cream resulted in tighter feeling skin with more elasticity. Glowing complexion– Some have reported having a nice glow on their face because of this product. Softness and Smoothness– Along with making their skin look younger, users love how soft and smooth their skin feels. Men’s favorite– Men also like this product for its anti aging effect. 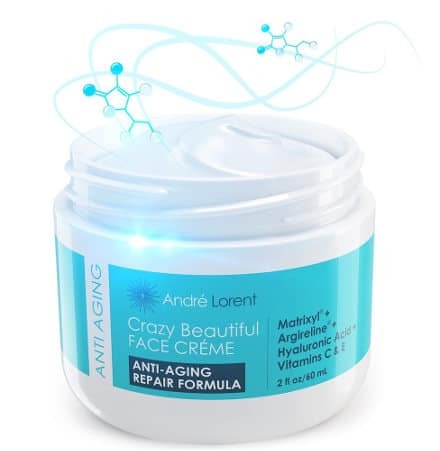 Overall, users love the fact that this formula combines so many effective anti aging ingredients in a jar of 2 oz, at such an affordable price, with a 100% money guarantee, and the Andre Lorent Crazy Beautiful Anti Aging Face Cream reviews testify this. Finally, if you are interested to find out about other Andre Lorent skin care products as well, you can read our review on Andre Lorent Eye Cream.